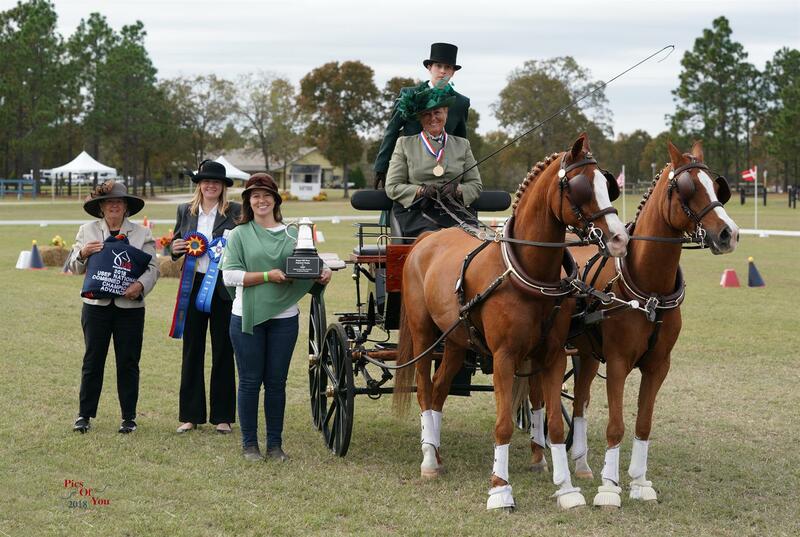 Aiken, S.C. – Jennifer Keeler and Katie Whaley capped off an epic combined driving season by winning the final USEF Combined Driving National Championships of 2018 following the Katydid CDE on Sunday. After three phases of competition, Keeler finished with 149.45 penalties to secure the USEF Advanced Single Pony Combined Driving National Championship, while Whaley ended with 158.01 penalties to claim the USEF Pair Pony National Championship. The leaderboard in the single pony championship division swayed in a variety of directions over the course of the three-day competition. Following the driven dressage phase, Keeler and Amazing Grace found themselves in fourth place with 55.64 penalties. However, they picked up much needed ground during Saturday’s marathon. Keeler and her eight-year-old Dutch Harness Cross mare tactfully completed Barry Hunter’s course to end on 86.13 penalties, besting the field. This moved them into second place with 141.77 overall penalties, close behind the 2016 USEF Single Pony National Champions Leslie Berndl (Lexington, Ky.) and Sweetwater’s Zorah Belle with 140.18 penalties. 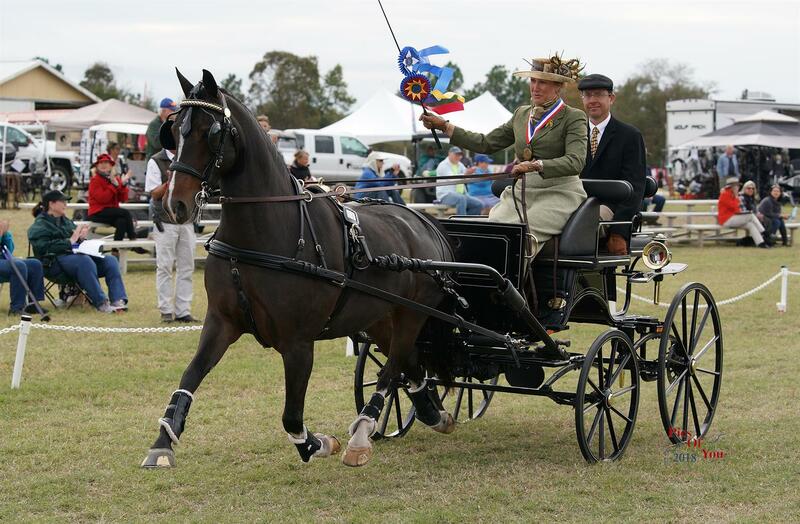 “We started out with a disappointing dressage test. Grace is normally very good at dressage but was just a bit tense at this level, and you get punished for that. I tried to come into this show with very few expectations. This was the first time we competed against ponies with such accomplished resumes. Even though it was a small field, it was an incredibly tough field. I was not sure where we would stack up. I was most proud with marathon. [Navigator] David and I have worked very hard on taking it to the next level by adding new skills, and she was incredible. Everything came together for us as a team, and I am super proud of that,” added Keeler. On Sunday, the competition took a climatic turn when Berndl and the 14-year-old Norwegian Fjord Horse mare owned by Teressa Kandianis, unfortunately, veered off course during the cones phase, causing their elimination. This paved the way for Keeler and Amazing Grace’s victory. They added 7.68 penalties to their overall score, holding off reserve champions Tracey Morgan (Beallsville, Md.) and Fuego 88, who finished with 153.77 total penalties. “This was a great cones course from Barry Hunter and deceptively difficult, and I just wanted to drive well. It was not my best cones round, but to come out with a victory is great. However, I have some mixed feelings as it is unfortunate that it was at the expense of another competitor,” said Keeler. The defending single pony national champions Morgan and her 17-year-old German Riding Pony gelding, members of the USEF Combined Driving Program for Elite Athletes, snatched the early lead following dressage, ending with 46.84 penalties. However, they dropped to fourth following marathon, adding 103.93 penalties. They redeemed themselves with a strong cones phase, dropping one ball to win the phase. “It’s always a thrill. The national championships always have the most difficult courses and best designers and competition. This was a competitive group; Fuego’s forte has always been in dressage and cones, and he was consistent, and I was very pleased with him. He was the only pony in the division to make time, and it was very difficult to make time on that challenging course. Katydid did a phenomenal job hosting these championships; it was so well run, and the facility was terrific,” said Morgan. Whaley (Paris, Ky.) brought in Night Flyer, Barbara Sims’s 18-year-old Welsh Pony Cob gelding, to assist her mainstay Welsh Pony geldings, 15-year-old Tommy and 12-year-old Tanner, to win the USEF Advanced Pair Pony Combined Driving National Championship. Tommy and Night Flyer got the team started on Thursday with dressage and finished with 56.75 penalties. She turned the marathon and cones phases over to Tommy and Tanner, who added 97.54 penalties and 3.72 penalties, respectively. Stay up to date with USA Combined Driving on Facebook and US Equestrian on Instagram and Twitter. Use #USADriving.